Penn Yan Central School District is situated on the northern most tip of the beautiful Keuka Lake in the heart of the Finger Lakes Region of New York State. The name Penn Yan is taken from “Pennsylvania” and “Yankee” in honor of its early settlers who migrated here in the 18th century. This unique and historic village has a variety of small businesses including Birkett Mills, which is Penn Yan’s oldest industry , established in 1797. The mill is the world’s largest producer of buckwheat products. 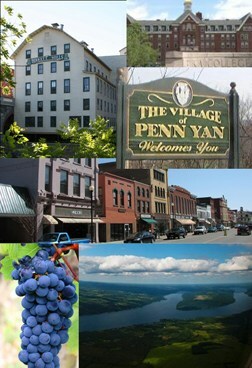 Penn Yan is also known for its agricultural industry. The area produces a large variety of crops including corn, soy beans, grapes, apples and wheat. Because of the picturesque landscape, wineries, and Keuka Lake, travel and tourism are very popular in the area. Both of these industries are the foundation for Penn Yan’s economy. Penn Yan and Yates County are home to a large Mennonite community that help support the Penn Yan area with handmade goods, services and agriculture. The community is also supported by a Penn Yan Public Library, Soldiers and Sailors Hospital, Yates County ARC and Keuka College. All of these community partners help to make Penn Yan a wonderful environment for work, play and raising a family. Penn Yan Central School District is comprised of three schools: Penn Yan Academy, Penn Yan Middle School, and Penn Yan Elementary School. The district population is 1,570 students in grades Pre-Kindergarten to twelfth grade. The district employs 360 people, which includes instructional, support and transportation staff. The district has an operating budget of $32,600,000. This building is a PreK – grade 5 building. The elementary program is designed to meet the needs of the whole child. The students are engaged in a strong data driven system to get all students off to a solid start in both English Language Arts (ELA) and Math. Penn Yan Elementary has a well-defined art and music program. The music program has a large population of students in band, orchestra and chorus and all students are involved in the art classes. These programs are supported by multiage classrooms, reading recovery, special education, and other strong intervention and literacy and mathematic programs to support academic achievement and socialization. There are approximately 600 students serviced in the elementary building. Penn Yan Middle School (6-8) uses an interdisciplinary team approach supported by strong home-school connections and parent-teacher partnerships for its approximately 390 students. The middle school boasts strong core academic programs along with offerings in Art, Home & Careers, Technology and Music. Advanced courses are offered in Math and Science. Clubs, sports and intramural offerings allow students to experience many activities as they move through their school career. Penn Yan Academy (9-12) is an accredited high school housing approximately 590 students. PYA recognizes that the educational process encompasses the rights, responsibilities, differences, and needs of all students, staff, parents and community. PYA provides instruction and curriculum to continue to ensure that students are competitive upon graduation for the 21st century. The Academy is now a state of the art facility that rivals the learning spaces found in a collegiate setting. PYA offers a strong educational program including eight (8) AP courses, twenty-one (21) Dual Enrollment Gemini Courses, Project Lead the Way courses in both Engineering and Biomedical Sciences, along with a strong Agriculture program and six (6) State recognized programs in CTE. The District has also partnered with the Yates ARC and Keuka College to offer an innovative D.R.I.V.E. Program at Keuka College for our post high school age learners with special needs.